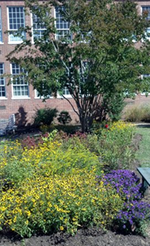 Permission slips for 4th and 5th grade garden club have been distributed in school. The estimated start date is October 3rd. We will likely run about 8 weeks depending on the weather. Kids should return permission slips to their teachers or to Laura Volk Farr, the Outdoor Classroom Coordinator, directly when they come to garden club. Garden club meets on Wednesdays during their recess. It is completely optional and they can opt to come one week and not another. We will start the year planting around the new patio. We are hoping to build a hydroponics system with them as well. Read about the Outdoor Classroom here.